That its made from plastic. I bought one because I work for a lady that owns one. She has had it for a long time, and works great on bare floors. I wish the width of the sweeper was wider to get done faster, but no bag, so just dump and go. This powerful, maneuverable, upright vacuum is lightweight at only 10.6 pounds. The smallest of the Navigator lineup, the Navigator Light is compact and easy to store, all while providing the cleaning performance of a full-sized upright vacuum. Its power nozzle deep cleans carpets and bare floors with ease, while its two-motor system, with brush roll shut-off, provides optimized settings for whatever your issue. On-board tools include the pet upholstery brush and combination dusting/crevice tool, providing versatile cleaning throughout the home and beyond. Lightweight and maneuverable at only 10.6 lbs. I was expecting more from this little machine, but was disappointed. Unfortunately it just does not perform well on my hardwoods. To be fair, I have a Dyson canister vac, which is pretty hard to beat, so I am used to top end performance. My Dyson is a heavy to drag up and down stairs, and is extremely messy to empty (as all Dysons are). I was really wanting something that I could use to vacuum up light messes on carpet and wood, as well as use on stairs to clean up between monthly deep vacuums with the Dyson. Based on this models description and reviews, I thought surely this would fit the bill. But it didn't. I have a mix of antique hardwoods and modern hardwoods with area rugs throughout, and I also have tile flooring in 2 bathrooms, laminate flooring in a 3rd bathroom, and luxury vinyl tiles in the kitchen. I also have carpeted stairs. This Shark model is super light and maneuvers ok, and the cord is a nice long length. But it did not perform well on any of the hard flooring. Without the brush spinning, it barely picked up anything and did not have strong enough suction to pick up cat litter from the gaps between the hardwood planks. On the vinyl in the kitchen, it sucked up hair and surface dust but just moved large debris around. Also, the wheels were not very gentle on my modern oak hardwoods and left slight scuffs in a few places that I can see from certain angles (my antique hardwoods faired just fine, though. They are old growth wood afterall). Finally, as an upright, it didn't get into corners well. The PROS: With the brush spinning as an upright, it worked VERY well on my wool area rugs. It is VERY self propelled. I can see how people who lack the strength to run a heavy vacuum in a carpeted house could love this. And it is VERY easy to empty, as most Sharks are (a huge one up on any Dyson). As I mentioned before, decent maneuverability and good cord length. So, even though it's not going to work as a full house vacuum for me, I am going to keep it to use as an area rug vacuum only, (rug fibres are the hardest to clean from my Dyson anyway) and use my Dyson strictly for the hardwoods and stairs. 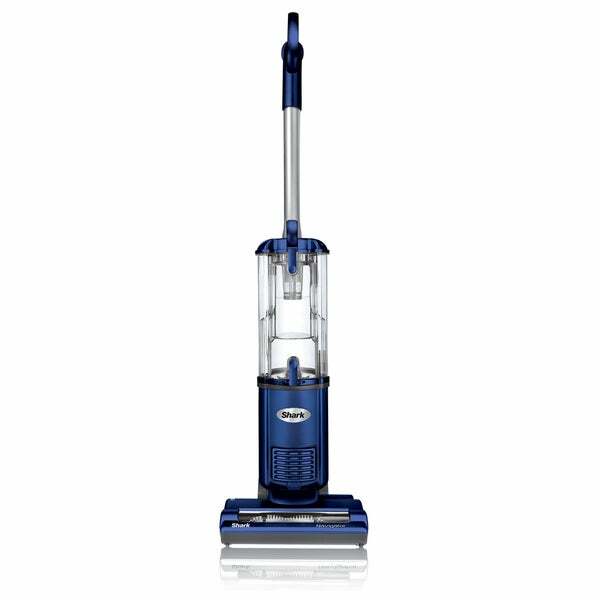 Bought two of this upright vacuum cleaner, one for each floor of my house. Light weight and easy to assemble. This product came wrapped really well. I love the vacuum it’s incredibly lightweight and easy to navigate. Great suction power too. Pretty happy with it. This vacuum is light weight and easy to use. I love how this cleans and picks up everything also I love how easy it is to clean it as some vacuums are hard to clean. Love this Shark Navigator, picks up even light dust, and pet hairs. Good suction. fast delivery. Lightweight, small, great suction, picks up well including dog hair. Great for everyday use. The Shark is light weight and easy to use on floors or carpet. I now have two of them. This is the perfect little vacuum cleaner for my house. It's lightweight with a cord long enough to vacuum my entire living/dining space. The brushes are able to fluff my old Berber rug; which my old large canister vacuum could not do. While the canister is small and needs to emptied often, all of the attachments and hoses are easily detachable and easily cleaned. I've only had this for a couple of weeks, but I will likely buy another one when this one needs replacing. We purchased an upright vacuum years ago because it was highly rated by Consumer Reports. Problem is it's very heavy to haul up and down stairs. This new Shark Navigator is something I should have purchased a long time ago. It is easy to handle, vacuums well, gets under furniture easily and is easy to clean. I love it. So far love it! Love that you can control the beater bar for hand hooked rugs! No pulls! Best vacuum I've had to date! Picks up pet hair and kitty litter without any problem. It is also nice that this vacuum with all its power is quiet, meaning I can vacuum in the early morning or late evening without a worry of waking up my family. I like it. Comes with directions, and a help phone number. Easy to carry around the house. Love this vacuum! This is my 2nd one. Suction is great. Not too heavy. Amazed at how much dirt and pet hair it picks up! Have not had any problems. Shark makes amazing products!! Seems to work pretty good for what i need it for... I did notice it missing a piece but I dont want to go through the entire process of retuning it and waiting on a new one... Overall happy with the performance of the cleaner! Purchased it as a gift for someone’s first apartment. It’s very compact. Much smaller than I thought it would be, but they love it. I am told it works well. LOVE LOVE LOVE this vacuum. Its small but it is super powerful. I love that it moves on its own ;) wqs an awesome price for an awesome vacuum. So happy we purchased this! It’s a great vacuum for small area rugs. I do not recommend buying this vacuum if you are going to use it on carpeted rooms or shaggy area rugs. "can you adjust the suction?" "Can I use this on oriental Rugs?" "what is the weight vacuum?" The weight is 14 pounds. Items must be returned in new or unused condition and contain all original materials included with the shipment. For more information on our return policy, please click on the shipping and returns tab. "How much extra for the 2 year platinum protection plan? " The 2 year platinum protection plan is $16.39. Hello albanygal, the hose is able to expand to approximately 30 inches long. Thank you for shopping with us. I'm a very senior gal who needs a good but lighter weight vacuum. Shark has a good reputation and this model is perfect for me (and my husband!). Good ratings, lightweight and good price. lineup, the Navigator Light is compact and easy to store, all while providing the cleaning performance of a full-sized upright vacuum. Its power nozzle deep cleans carpets and bare floors with ease, while its two-motor system, with brush roll shut-off, provides optimized settings for whatever your issue. On-board tools include the pet upholstery brush and combination dusting/crevice tool, providing versatile cleaning throughout the home and beyond.